Replacing a legend is no easy feat but Anthony Badamo leapt at the opportunity to open his own spot when Caruso’s Pizza — a Mt. Lebanon institution for more than three decades — closed in late 2009. He opened his modest slice shop a few months later in early 2010 and he’s been very successful. In the years since, he’s doubled the size of his eponymous pizzeria and has managed to distinguish his pizza and name on a block of the Washington Road corridor that includes two of Pittsburgh’s most famous: Mineo’s and Il Pizzaiolo. Successful stints in corporate America and real estate weren’t enough for Rick Werner to shake a lifelong yen to run his own small business. So, at age 34, he quit and put it all on the peel, enrolling at the acclaimed VPN Americas — the American Delegation of the Associazione Vera Pizza Napoletana, in Marina Del Rey, Calif., which trains and certifies aspiring pizzaiolos in the preparation of the authentic Neapolitan pizza. He got in on the ground floor (literally) of the then-newly opened River Vue apartment building, Downtown, and since 2012 with the help of his younger sister Nicole has turned out perfect Naples pies: hand-stretched dough that’s wood-fired at 900 degrees and done in 90 seconds. It might be a stretch to suggest that if you cut Carmen Pirain open, he’d bleed tomato sauce, but he is “type 00” — as in the Neapolitan flour used in his dough. He started spinning dough and baking pies as a kid at his family’s Mount Washington slice shop, Cestone’s, and continued through college and his 20s to master his craft. In 2011, he put together the sum of that experience to open Cucina Bella in Bridgeville, a BYOB spot for gorgeous gourmet pizzas, such as the “Pizza Anna” pictured here and made with fresh goat cheese, fresh mozzarella, roasted red peppers, red onion, Parmigiano-Reggiano, basil, a balsamic fig reduction and a dough that uses a “three-day rise” technique in which the flour is mixed with Sicilian sea salt, water, and a piece of dough from the day before. If necessity is the mother of invention, so too is unemployment. That’s the spot Shelly Farren, a longtime employee of Vincent’s Pizza Park, found herself in when that North Braddock institution of six decades abruptly closed in the spring of 2012. Around the same time, her old friends purchased the former Turtle Creek VFW building and the idea of a pizza place — run by Ms. Farren — was broached. Shelly Pie Pizza was born. This prodigious pizza is doughy, gooey, greasy and spicy, and there is almost no dignified way to eat it. But that’s part of the fun. The old bomb shelter-esque Moose Lodge No. 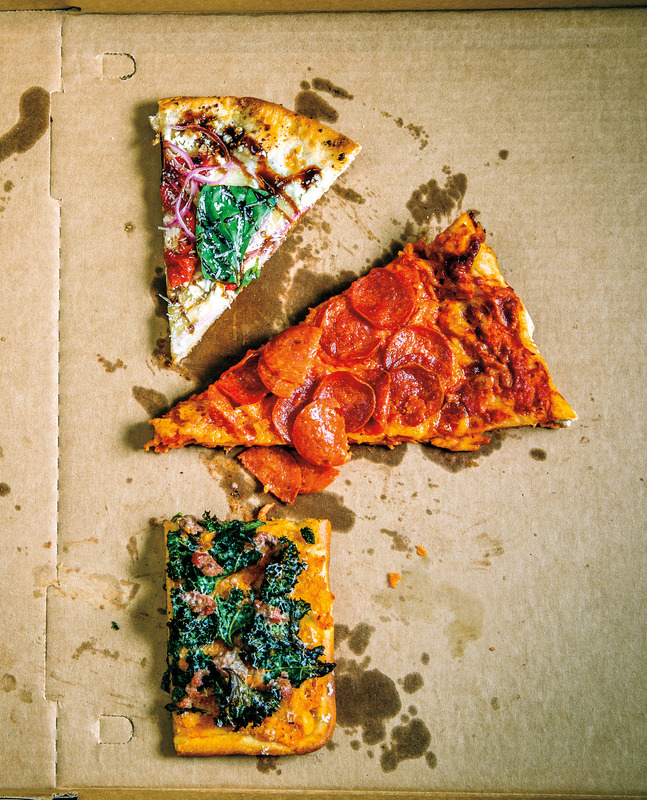 581 on 51st Street in Lawrenceville has been turned into a labyrinth of live music and pizza pies brought to Pittsburgh by area native Jeff Ryan and his friends who once toiled at legendary Brooklyn pizzeria Roberta’s. The style is “Thin Sicilian,” and unlike the typically airy inch-high rhombi you’ve come to expect, this is a delicious and dense crust, barely a quarter-inch thick with a crackling crispness that could chip a veneer. There are three pies available — cheese, meat and veg — and they change each Tuesday.